If you live in Perth you’ve probably noticed a few changes to the CBD lately. No matter how small these alterations seem, each plays a role in transforming the most isolated capital city in the world to a highly efficient, sustainable metropolis. On my daily commute from home to work and back I am fortunate to witness the gradual transformation. Two years ago options of after hours entertainment within the CBD on a weeknight were extremely limited. Today, with the bustling Brookfield Place development and introduction of extended shopping hours there is more to stay back for. Before long, the Perth of yesterday will be forgotten and the Perth of present will be a dense hub of activity. I think it is important to document this transformation as a part of this city’s history. 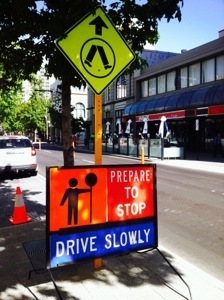 Below: Murray Street becomes two-way in order to allow motorists to navigate through the CBD with more ease.